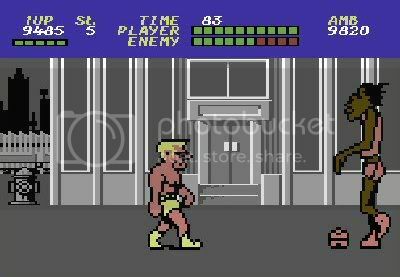 by PaulEMoz in "Commodore 64", "Double Dragon", "Melbourne House", "Renegade", "Street Hassle"
I've got such good memories of playing this. I doubt if many other people have, though, so it's becoming the latest in my irregular, infrequent and unmissable "Unsung Classics" series. OK, so the "unmissable" might be a bit of a stretch. My mate Reedy, who has been mentioned here a number of times so far, bought this. I think it was from the fabled bookshop in Consett's bus station, but I can't remember. What I can remember is that it resulted in some of the best laughs we had from gaming. 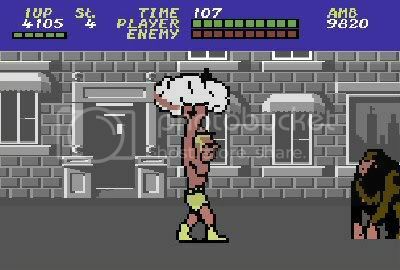 Street Hassle is an Australian game. I reckon that maybe they could get away with a bit more down there. 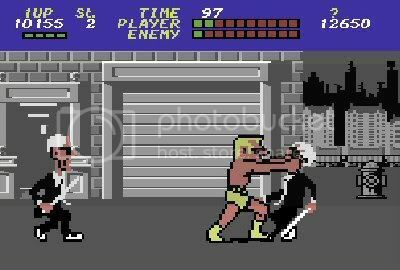 I say this, because it's imaginatively twisted, for a beat 'em up, and I'm not sure if we were quite at their level in 1987. Right: Rock icon Graham Bonnet. Left: Underwear Man. The character you play is a blonde, muscle-bound guy, who wanders through the suburbs dressed only in yellow boots and underpants, and a pair of sunglasses, looking for all the world like Graham Bonnet on holiday. Naturally, this causes consternation among the residents, and they set about attacking you in an attempt to clean up the 'hood. There's not a "normal" resident to be seen, though. These crazy 'burbs are inhabited by all sorts. There are old blind men that will poke you with their sticks. I mean that... if you stand still, they'll walk up, look at you and then prod you in a mean way. Little old ladies will swing their handbags around their heads and fling them at you... if they remember to let go. If not, they'll be helicoptered across the screen at you. Gorillas routinely amble about, and will give you a good thrashing. Bulldogs are vicious things, but can be soothed with a tickle on the tum. There are lumbering fatties, elaborately-dressed wrestlers, basketball players. It's an odd sort of place. See, that's how to deal with pesky grannies. That's payback for all the times they've smashed my shins with their brick-filled purse-bag-things. Fortunately, you're able to fend off this lot with an array of attacks of your own. 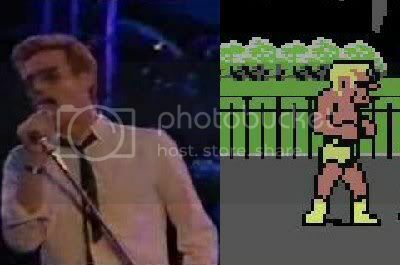 You've got a couple of standard attacks - a roundhouse kick and, umm, a tickle - and you get two special moves per level. These are different for each of the first five levels, meaning you have a total of twelve moves across the game. More than enough to cope with the scum you're up against. This one had even me perplexed. Street Hassle is a fairly mental side-scrolling beat 'em up. It's more basic than the likes of Double Dragon or Renegade, in that you can only move left or right, but it makes up for it by having a sense of humour unlike any other scrolling fighter. Where else do you get to twirl old ladies above your head before throwing them out of sight, or twist a blind old man's ears until he submits? Nowhere else, that's where. Poke me with your stick, would you? Let's see how you like your ears twisted. Not much? Thought not. For all that I enjoy playing the game and it's pretty funny, it is still limited, and so nowadays it's best played in one session and then left alone for a while, otherwise it's likely to get old. Most comedy does, but nothing moreso than a daft videogame. But it was great for its time, and given a quick spin it's still very likely to bring a smile to your face.